Fit-4-Evah a physical activity program taught by Certified Instructor and Personal Trainer, Fran Bigney, for building muscular strength, flexibility and endurance while also working on balance. 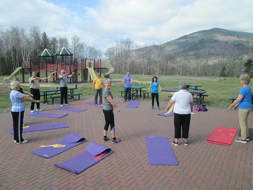 Regular attendance promotes the health of bones, heart, lungs, and blood vessels by incorporating yoga, Pilates, chi-gung, and neuro-muscular exercise with traditional weight training, elastic resistance, cardio, and flexibility exercise in a fun and lively group setting. Participation will likely improve posture, self-esteem, confidence, relationships, and overall health. The classes are on the poolside deck in inclement weather and on the fresh air patio when weather cooperates. Music, movement, education, and laughter abound. Give it a try!